Williamsburg, Virginia was the thriving capital of the commonwealth when the dream of American freedom and independence was taking shape. Serving as Virginia’s capitol from 1699 to 1780, Williamsburg was the center of government, education, and culture, where important figures such as George Washington, Thomas Jefferson, Patrick Henry, James Monroe, James Madison, George Wythe, Peyton Randolph, and others worked first for the British government and later to form the new United States. 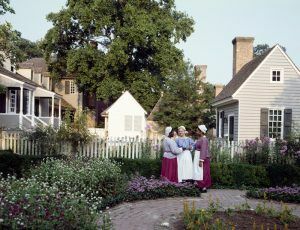 Today, Colonial Williamsburg is a living history museum which comprises the Williamsburg, Virginia Historic District. The 301-acre Historic Area includes buildings from the 17th through the 19th century as well as re-created buildings related to its colonial and American Revolutionary War history. It is one of the most ambitious restoration projects in the country. Prior to the arrival of the English colonists at Jamestown, Virginia in 1607, the area was inhabited by the Powhatan Confederacy. However, by the 1630s, English settlements had grown to dominate the eastern portion of the Virginia Peninsula, and the Powhatan tribes had abandoned their nearby villages. In 1632, a fortified settlement called the Middle Plantation was built on high ground between the James and York Rivers. This site represented the first major inland settlement for the colony. Its growth was encouraged by the completion in 1634 of a continuous palisade across the Virginia peninsula which was about six miles long. The original Bruton Parish Church was constructed in 1633. In 1693, Middle Plantation was selected as the site of the new College of William & Mary. A school of higher education had long been an aspiration of the colonists. The school was named for the reigning King and Queen of England and opened in temporary buildings in 1694. Construction of new permanent buildings immediately began and today, it is the second-oldest institution of higher education in the United States. 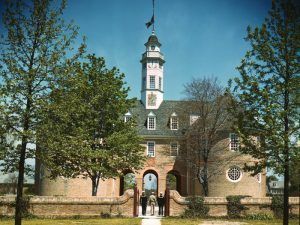 On October 20, 1698, the statehouse in Jamestown burned down and the legislators moved their meetings to College of William & Mary. In 1699, the colonial capital was officially moved to Middle Plantation, putting an end to Jamestown’s 92-year run as Virginia’s colonial capital. An official town was then laid out and was renamed Williamsburg in honor of King William III of Great Britain. Immediate plans were also made for the construction of a new capitol building. Over the next decades, Williamsburg grew, was improved, and more buildings were constructed. In 1771, it was the site of the first attempted canal in the United States. That year, Virginia’s last Royal Governor, Lord Dunmore, announced plans to connect Archer’s Creek to York River, forming a water route across the Virginia Peninsula, but the canal was never completed. 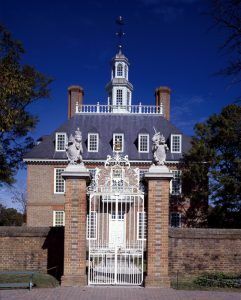 However, remains of its construction can still be seen behind the Governor’s Palace in Colonial Williamsburg. The same year, a two-story psychiatric hospital was built, capable of housing 24 patients. The “Public Hospital for Persons of Insane and Disordered Minds” was the first of its kind in the United States. In April 1775 as a dispute occurred between Governor Dunmore and Virginia colonists over gunpowder stored in the Williamsburg magazine. Dunmore, fearing rebellion, ordered royal marines to seize gunpowder and Patrick Henry responded by leading the Virginia Militia into the town, where a standoff ensued. Dunmore threatened to destroy the city if attacked by the militia, but the dispute was resolved when payment for the powder was arranged. This was an important precursor in the run-up to the American Revolution. Following the Declaration of Independence from Britain, the American Revolution broke out in 1776. During the War, the capital of Virginia was moved again in 1780, this time to Richmond at the urging of then-Governor Thomas Jefferson, who feared Williamsburg’s location made it vulnerable to British attack. 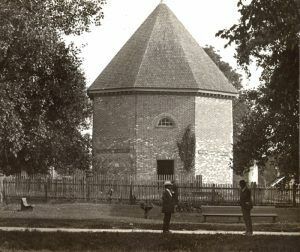 However, during the war, Williamsburg retained its status as a venue for many important conventions. After the capital was moved, Williamsburg began to decline. Another factor in its decline was its location on high ground. During these years transportation in the colony was largely by canals and navigable rivers and the town was not sited on a major water route. When the railroads began to be built in the 1830s, Williamsburg was bypassed. However, the College of William and Mary continued and expanded, as did the Public Hospital for Persons of Insane and Disordered Minds, which later became known as Eastern State Hospital. When the Civil War began in 1861, the student body of the college was depleted as the young men joined the Confederate Army. 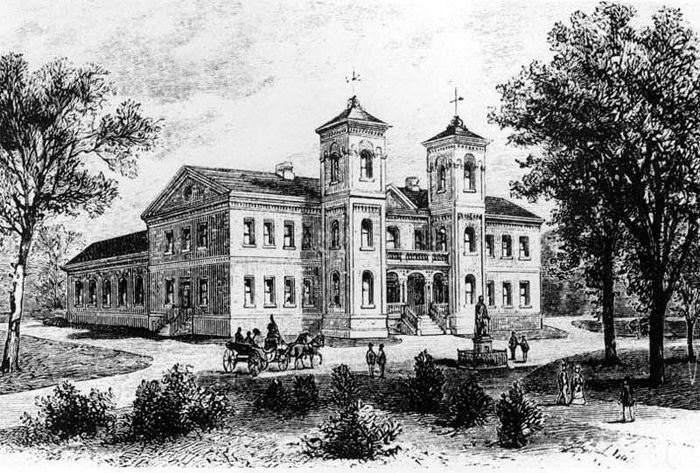 The College of William and Mary closed on May 10, 1861, and remained so for the duration of the conflict. The College Building was then used as a Confederate barracks and later as a hospital, before being burned by Union forces in 1862. 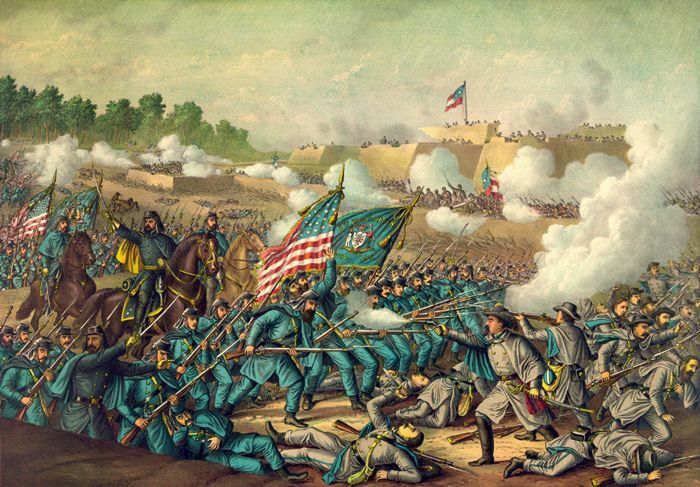 On May 5, 1862, the Battle of Williamsburg took place during the Peninsula Campaign when Union soldiers were following up the Confederate retreat from Yorktown. 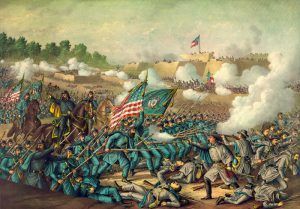 The battle took place when the Federals caught up with the Confederates at Fort Magruder, an earthen fortification alongside the Williamsburg Road. The defenders succeeded in delaying the Union forces long enough for the retreating Confederates to reach the outer defenses of Richmond. But, Williamsburg had fallen to the Union and continued to be occupied until September 1865. The College of William and Mary remained closed until 1869. However, it closed again in 1882 due to lack of funds and didn’t reopen again until 1886. At that time, the college became a state school. In March 1906, the General Assembly passed an act taking over the grounds of the colonial institution, and it has remained publicly supported ever since. In 1918, William & Mary became one of the first universities in Virginia to admit women and become coeducational. The school remains in operation today. 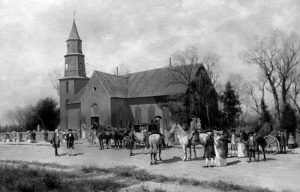 However, that changed when the Reverend Dr. W. A. R. Goodwin of Williamsburg’s Bruton Parish Church determined to expand and change Williamsburg’s future, provide it with a new major purpose, and turn much of the town into a massive living museum. Initially, Goodwin aimed to save his historic church building, which was accomplished by 1907. Afterward, Goodwin served for a number of years in upstate New York before he returned to Williamsburg in 1923. Upon his return, he realized that many of the other colonial-era buildings were also deteriorating and dreamed of a much larger restoration. He sought support and financing from a number of sources before successfully attracting the interest and major financial help of Standard Oil heir and philanthropist John D. Rockefeller Jr. and his wife Abby Aldrich Rockefeller. Their combined efforts created Colonial Williamsburg, involving restoration of much of the downtown Williamsburg area and the creation of a 301-acre Historic Area, celebrating the patriots and the early history of America. Governors Palace in Williamsburg, Virginia by Carol Highsmith. One of the most ambitious restoration projects in the country began in 1927. The project involved the razing or removal of some 600 buildings, the restoration of approximately 100, and the reconstruction of about 350 on their original sites. Noteworthy restorations include the Wren Building (1695-1702), Brafferton Hall (1723) and the President’s House (1732), all of the College of William and Mory; the Public Magazine (1714); the Ludwell-Paradise House (1717); the old Courthouse (1770); Bruton Parish Church (1710-15); and the George Wythe House (1755). Among the more ambitious reconstructions were the Governor’s Palace (originally built 1706-20); the Colonial Capitol Building (originally constructed 1701-05); and the Raleigh Tavern (originally built before 1742). A new Reception Center, located outside the restored area, was also built and now serves as the center of the interpretive program for Colonial Williamsburg. In addition to the Historic Area of Colonial Williamsburg, the city’s railroad station was restored to become an intermodal passenger facility. Other landmarks outside the historic area include Carter’s Grove and Gunston Hall. 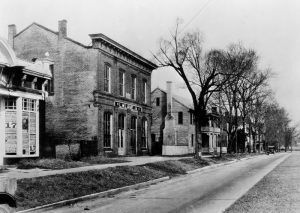 The Williamsburg Historic District was designated a National Historic Landmark District on October 9, 1960, and was listed on the National Register of Historic Places on October 15, 1966. Today, Colonial Williamsburg is Virginia’s busiest tourist attraction and is the cornerstone of the Historic Triangle with Jamestown and Yorktown joined by the Colonial Parkway. In the 21st century, Williamsburg has continued to update and refine its attractions. More than a century after Goodwin’s work began, this masterpiece of Virginia and United States history remains a remarkable work-in-progress. Colonial Williamsburg, Virginia Re-enactors by Carol Highsmith. The city of Williamsburg is now called home to about 15,000 people with its economy primarily driven by tourism. The Historic Triangle attracts more than four million tourists each year.